Today we published our entry on John White. You might know him as the governor of the Lost Colony at Roanoke and grandfather to Virginia Dare, the first child born to English parents in America. 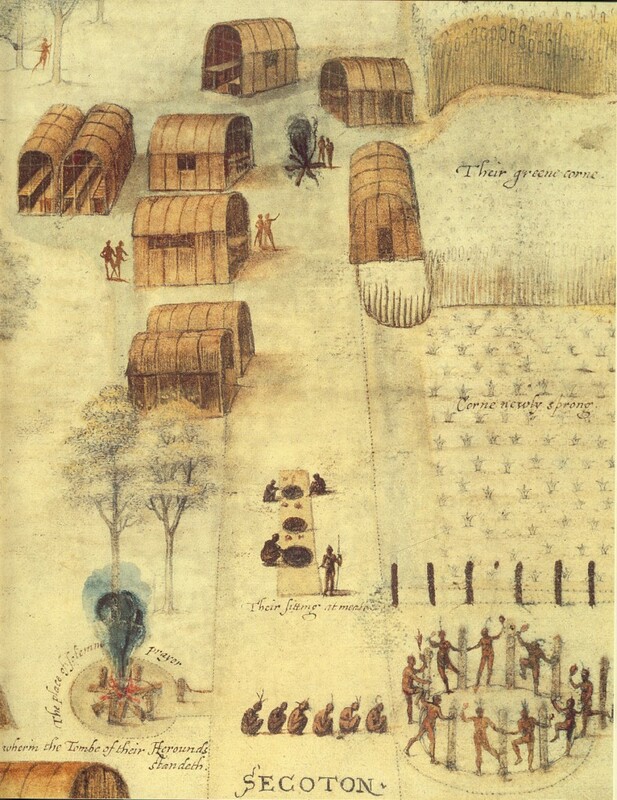 But White’s most important legacy are his watercolor depictions of the places and people he encountered at Roanoke in 1585–1586. Take the image above of the Indian town Secotan (or Secoton), which White and a group of Englishmen visited in mid-July 1585. It’s a remarkably detailed account of architecture, landscape, agriculture, and lifeways. But more than that, it’s just beautiful! A few years later, the Flemish engraver and publisher Theodor de Bry repurposed White’s watercolors, adding and subtracting certain details, in some cases Westernizing people’s postures. These images were then published widely and became, for Europe, the standard depiction of American Indians. White’s particulars had become generic. On the left you have White’s original painting of a weroance, or chief, “painted for a great solemn gathering.” Click here to see a larger version; in the meantime, White’s caption reads: “The manner of their attire and / painting themselves when / they goe to their generall / huntings, or at their / Solemne feasts.” The hand on the hip and the pointed toe, by the way, are the trademarks of what was called the “Hapsburg posture,” a pose associated with Nicholas Hilliard, Queen Elizabeth’s favorite miniaturist. In 1590, de Bry engraved the next image as an illustration for Thomas Hariot‘s A Briefe and True Report. Hariot was at Roanoke with White, and de Bry used Hariot’s descriptions to add detail to White’s original drawings, especially in the backgrounds. In this case, de Bry kept the Hapsburg pose but flipped the figure, subtracted much of the body paint, lengthened the face a little bit (? ), and added an arrow in the hand. (It’s rather awkward-looking, though, isn’t it?) He also slightly exaggerated the pose. Notice how the chief’s body and bow seem to curve symmetrically; it all reads much more classical Europe than indigenous North America, but that was de Bry’s audience. This is what they could relate to. Oh, and de Bry also added a back view of the chief; I cut it out, but you can see a full, hand-colored version here. The third engraving was done by Robert Vaughan for John Smith’s 1624 publication of The Generall Historie of Virginia, New-England, and the Summer Isles. The Indian is supposed to be Opechancanough, with whom John Smith tangled in 1609. 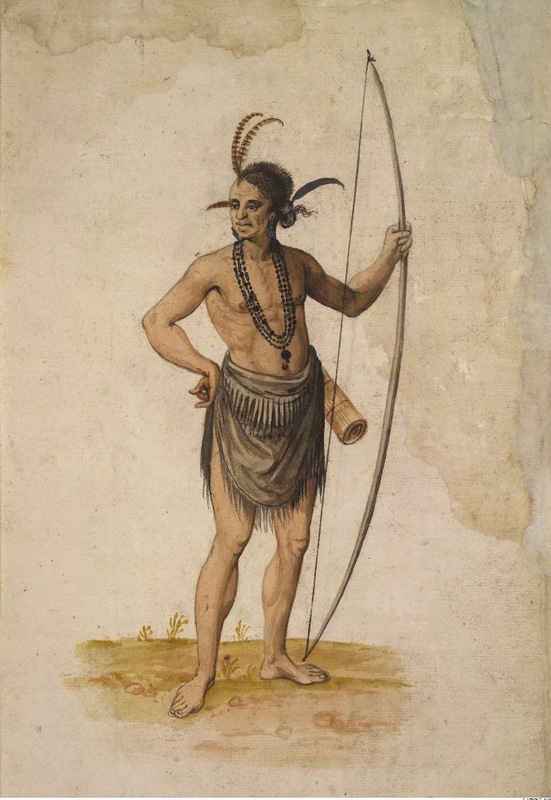 But no images of Opechancanough taken from life exist, so the artist did the next best thing: he called on de Bry’s generic Indian, which was taken from White. Finally, below is a drawing from the 1580s that, like the White pictures, is in the collection of the British Museum. And it appears to be after John White, but that’s all they know about it. For more information, check out A New World: England’s First View of America by Kim Sloan (Chapel Hill: University of North Carolina Press, 2007), especially pages 120–121. IMAGE: The White drawing and the unknown work are courtesy of the British Museum. Opechancanough comes to us from The Colonial Williamsburg Foundation. Paul Bolcik on Rebels in Frederick, but When?